Recipe by Leslie Barraza, Corporate Marketing Assistant, Wal-Mart. It isn't really a party without guacamole. Low in saturated fat, this guacamole dip tastes great on any chip, cracker or veggie. Hot peppers, garlic, and tomato slices can give this dip an extra “kick." 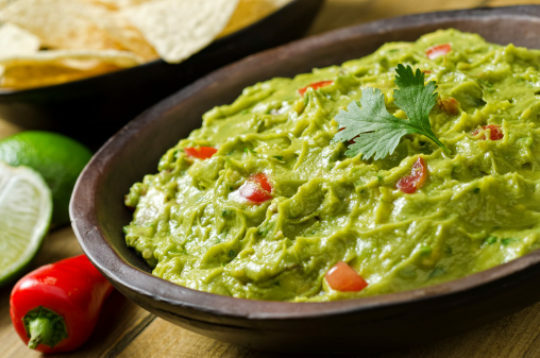 Guacamole is a favorite for any dipping occasion, and now we know that it's loaded with "good" fat! In a large mixing bowl, coarsely mash avocados, leaving some chunks. Add remaining ingredients and mix to blend. Guacamole is best made as close to serving as possible. For short-term storage, seal in an airtight container with a piece of plastic wrap against the surface of the guacamole. 10 one-half cup servings per recipe.